Maybe you’re in between homes, or your new place doesn’t have a designated area for your washer and dryer yet. Whatever your situation, the following tips will prove useful as you prepare your washer and dryer for storage. First thing’s first: clean your washer. You don’t want your washer to rust while it sits in storage. Nor do you want detergent residue to harden beyond the point of no return. Simply clean your washer by running a hot water cycle with vinegar. Then dry it with a towel. All you’ll want to do for your dryer is clean out the lint tray well, by simply rubbing a damp cloth against its filter. 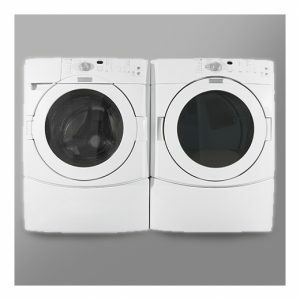 Many manuals actually lay out the steps for disconnecting your washer and dryer. You’ll want to consult a manual if you have it. Otherwise, generally you’ll want to turn off the water, the electricity breakers, and disconnect the hoses. Then your machines will be ready to move. You may be surprised by how light washers and dryers are. But, whether they’re light or heavy, you’ll want to purchase or borrow a dolly. Transportation will be much easier, and you won’t have to worry about denting or jarring anything. If you hire a moving company, don’t forget to stay informed about their policies. Wrap both your machines with either shrink wrap or a blanket. This will keep them clean from dust and protect them from dents and scratches, if you’ll be moving things around a lot. Another thing you’ll want to do is store them on pallets. This will keep them from forming condensation underneath, as pallets allow airflow. And, as a bonus, they’ll protect your units in the unlikely occasion that water gets into your unit.